Old Town has designed products with the paddler in mind for more than 100 years, the company says. The company’s tried to be innovative about that. 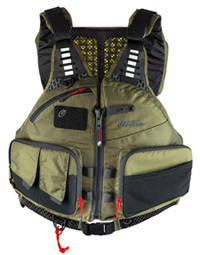 Here are Old Town’s latest life jackets or Personal Flotation Devices for kayak fishing. The Lure Angler, shown in the two photos at right and immediately below, is the top-of-the line, and is built specifically for Old Town’s kayak seats named the Element Seating System. The Lure Angler is at the pinnacle of PFD performance, the company says. 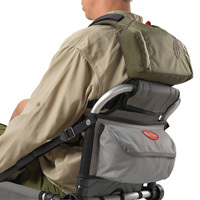 Features include “seamless seat integration,” the company’s AirComfort System for breathability, pockets for tackle-box storage, pockets for tippets or line spools, a pocket for a VHF radio, a GPS or a beverage, D-rings to attach things to, and more. The Treble Angler, shown in the photo below, is built for various kayak seats. Whether you’re a novice or experienced kayak angler, you’ll appreciate the Treble Angler's utility and comfort at the right price, the company says. The Treble Angler takes the best features of the Lure Angler and packs them into a lighter, slimmer package, it says. So it’s more of a lightweight construction. 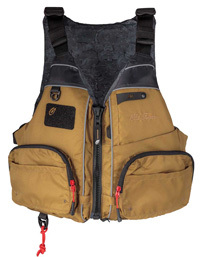 Features include pockets for tackle or gear, a pocket for a VHF radio, a GPS or a beverage, other pockets, D-rings and more. Both life jackets are built from tough nylon and are Coast Guard approved. For more info, visit Old Town’s website.